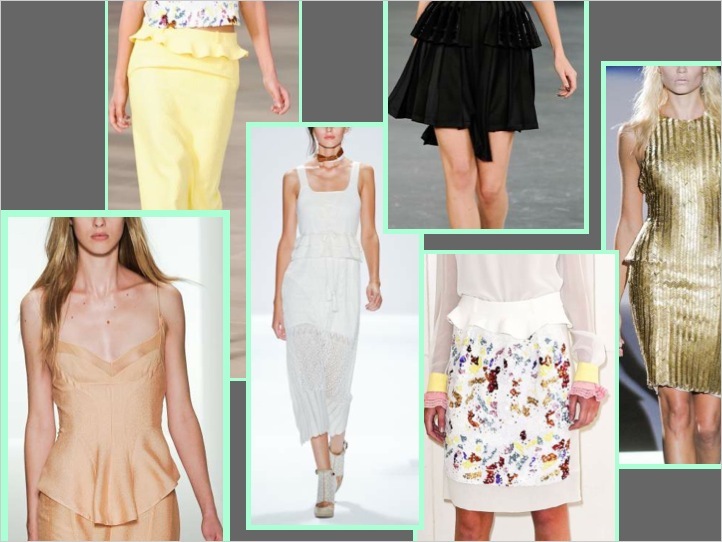 One of the most repeated design motifs for Spring 2012 has to be the PEPLUM. I won’t proceed without mentioning that peplum is not the easiest trend as it’s not the most flattering silhouette for the everyday person. However, designers must see something in the shape as they continually get inspired and the peplum continues to dominate the runway. I’m certain that by now you’ve read in multiple fashion sites that the peplum is a big trend. But only here at The Sche Report will you get a breakdown of the classifications as well as find out which interpretations will most likely end up in the stores or better yet inside your closet. The Peplum continues as a trend from last season. For Fall it was a major design detail accompanying the opulent and luxurious ladylike looks visible on the runways of brands such as LV, Givenchy, Lanvin…etc. For Spring 2012, while the big exaggerated version is still present, a new idea was introduced via a smaller and sleeker version, often reduced to just a light ruffle around the waist. The result stands out as fresh, energetic, clean, and sporty, all of which are red hot narratives for Spring. The aforementioned mini peplum (see above) was seen on both dresses and skirts. The slight added volume comes off as barely there and is much friendlier to the average consumer. As a consultant working with designers, this is definitely something we are conscious of when designing into the Fall 2012 season. Look out for pencil skirts or sheath dresses with a round of ruffles at the waist to be the hit items in stores next spring. 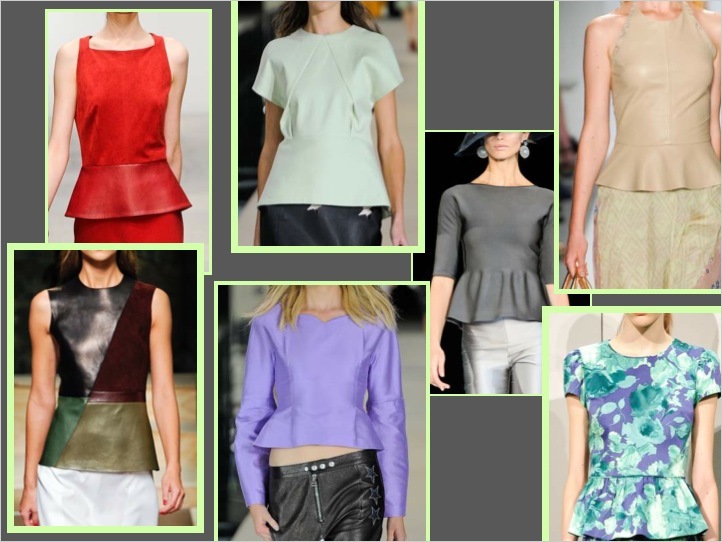 Another fresh peplum idea introduced by designers on the runway is a dropwaist silhouette. Most of the time peplums are placed either on the waist or at the hem but the drop waist placement is cute and unexpected. This peplum alludes to the 1920′s trend that is so predominant on the Spring runways. Lastly, another standout was the peplum top. Placing the peplum above the waist is deceptively risky and daring. On models it looks great but the added volume around the mid-section might not be welcomed by everyday consumers. With that said, designers are embracing this new shape, for instance Pheobe Philo at Celine as well as Emporio Armani both presented sleek flared tops and no doubt editors and stylists worldwide will be clamoring to present their own way to style this particular item. 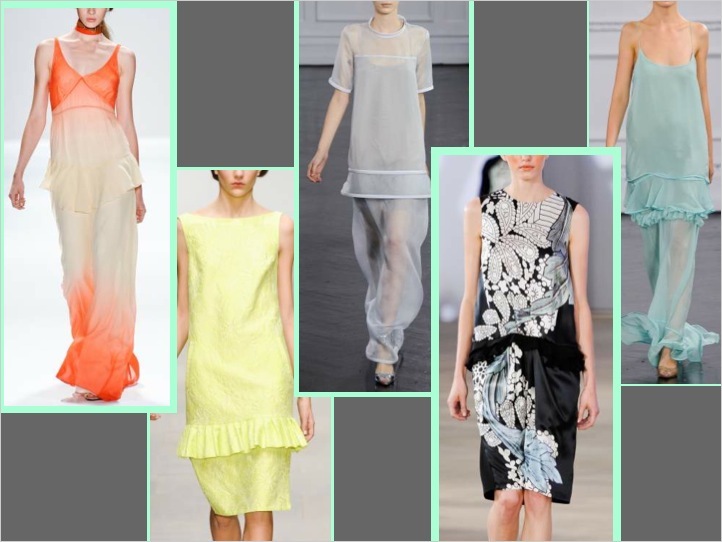 Stay tuned to The Sche Report for the latest Spring 2012 Trend Alerts! !